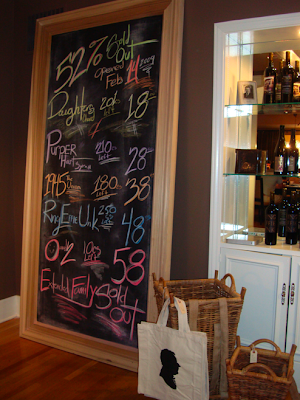 I do love the chalkboard painted walls in many homes. It's a clever and visual way to showcase black and creativity in your small space. When I spotted this leaning black board in a wooden frame, I thought it was a neat take on this. Fab! 6 Responses to "A NEW TAKE ON THE CHALKBOARD PAINT WALL"
Ah! This (and your blog) is an inspiring idea! I have been wondering about making a blackboard wall but this will allow me to do that as well as create a blackboard I can move around. I had been toying with the idea of finding an used, movable blackboard from a school to repurpose as both a screen (maybe behind a sofa) as well as an art piece that could include/involve guests. Yeah, it's very different and extremely useful at the same time, for groceries, upcoming events, or keeping score on game nights! I really like that too. It'd be perfect for a nice kitchen or a fun way for friends to leave you messages in your living room. I had some trouble using chalk board paint over a regular wall. It never accepted the chalk as well as a "real" slate chalk board like we used to have in school. I like the real thing much better, like the one shown in the picture.